»Canon»Are we really a church of revelation? We like to claim that we are a church led by revelation. In light of the last two posts (part 1 and part 2) by Guy Templeton, asking who among the current crop of apostles might give us a revelation, I thought it might be interesting to show a few graphs. 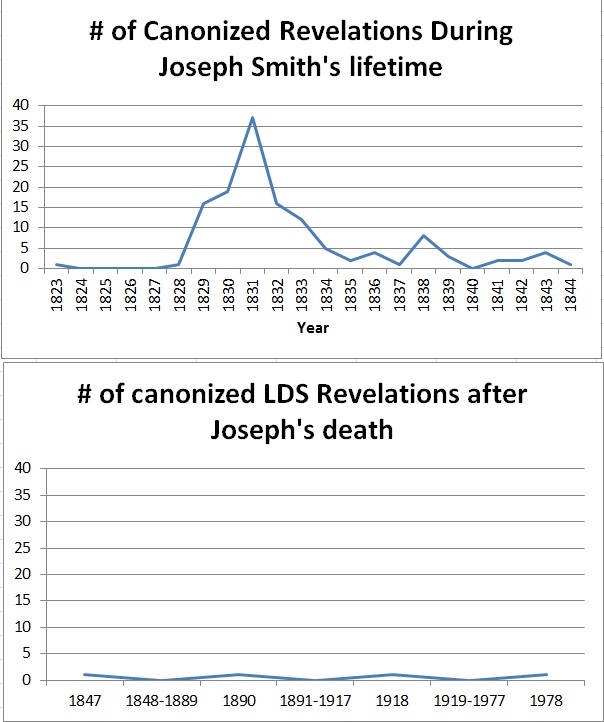 It’s interesting to compare the number of revelations in Joseph’s lifetime vs after his death. The high-water mark appears to be 1831, in which we have 37 revelations recorded in the Doctrine & Covenants. 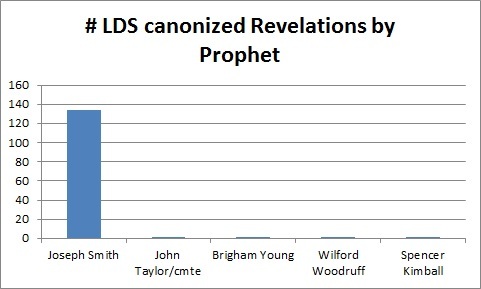 Then I thought it would be interesting to compare the number of revelations by prophet. The revised heading in the 2013 edition removes the statement that John Taylor authored this section. Although he has been identified as its author since the early twentieth century, those later attributions were only given as tentative. When the section was first published in the 1844 edition of the Doctrine and Covenants, it did not include an attribution, and no one involved in its publication ever identified the author. Evidence of who wrote the declaration is inconclusive. While it is clear that both Willard Richards and John Taylor, the only two surviving Latter-day Saint eyewitnesses to the murders of Joseph and Hyrum Smith, shared information that is part of this document, others may have contributed to its construction as well. I thought it would be interesting to look at the Community of Christ. Due to the lineal succession, and the fact that they started 30 years after our church, they seem to have taken the lead in revelations. All 8 presidents of the Community of Christ have issued revelations, though they don’t recognize most of the revelations out of the Nauvoo period, and have removed the sections on Baptism for the Dead. In spite of this, their graph is quite impressive. But God seems to be talking to the FLDS too! You can purchase Warren Jeffs’ revelations for as little as 14 cents (plus $3.99 shipping) on Amazon! This will bring you up through 2012. According to this article, Warren even has a prophecy that has been fulfilled! He prophecied of Moammar Qaddafi’s death! Gaddafi was killed on October 20, 2011, just five months after this was written. Could this be a fulfilled prophecy? Anyone who kept up with the news in May 2011—as Jeffs obviously did in prison—could have predicted Gaddafi’s eventual demise, as this leader was under intense siege for the final year of his reign. For example, a NATO airstrike killed one of Gaddafi’s sons and three grandsons in Tripoli on April 30, 2011. Just two weeks before this attack, Secretary of State Hillary Clinton called for Gaddafi to be captured or killed. Thus, it wasn’t a surprise to most observers when Gaddafi was finally captured in September 2011 and killed a month later. If you want to see the reveletory process, check out the video on my post from 2011 where Jeffs dictates a revelation to one of his followers. Before you get so smug to dismiss other church’s revelations, remember that non-LDS often malign the 1978 and 1890 revelations as untrue revelations due to pressure from civil rights groups and the government. Please comment kindly. Given Jeffs’ voluminous revelations, as well as the more modest revelations in the Community of Christ, can the LDS Church really claim that God is talking to us in these latter-days? Revelations to LDS leaders since Brigham Young’s one attempt have not come in the voice of the Lord (i.e., in first person). They are “spiritual impressions” that are then put into words by the leader or, probably more often nowadays, by a committee. It seems that the Lord no longer speaks in actual words or long paragraphs, as he did to Book of Mormon prophets and to Joseph Smith. David Haight once reported a similar experience in conference, though that was not canonized either. And a 1974 Conference on ongoing and non-canonical but received and recorded revelations as discussed in Conference by one Boyd K. Packer. And of course, D&C 1 on how God has spoken to “others” besides Joseph Smith, which means we can also look at non-canonical and non-LDS accounts with an open mind and discerning spirit. And there is something to be said for looking at the various ways that revelation comes. Kevin, I always appreciate your perspective. However yes this is about Canonized revelation. Are you open to Community of Christ or flds Revelations as binding upon us? I’m not sure if I or the church are ready for anymore canonized revelation. It seems we have enough problems with what we already have. Y.A. John: One plausible viewpoint I’ve heard expressed is “We as a people are not fully following the instructions already given; so why should we expect more?